Morrow County Special Olympics team members are, front row, from left, Jason Pryor, Dennis Payton, Glenn LaVan, Cody Cover. Back row, Larry Pryor, Andi Updike, Vinal Terry, Jim Trainer. Morrow County Special Olympics sent four two-person golf teams to Cincinnati Sept. 20 to compete in the 26th annual tournament, the largest State Special Olympics golf tournament in the country. The local delegation competed in the Unified Division. The Unified teams are formed by one Special Olympics golfer and one non-Special Olympics golfer or Partner, teaming up to play a round using an alternating shot format. The team of Larry Pryor and Jason Pryor shot 52 for their 9-hole round, good enough for a gold medal in their division. Dennis Payton and Andi Updike received silver medals for their 54. Glenn Lavan and Vinal Terry found themselves in a tough division and brought back bronze medals with a score of 50. Cody Cover and his partner Jim Trainer received bronze as well in their division, shooting a 59. The two-day event was hosted again by Meadow Links Golf Academy in the northern Cincinnati area. A big thank you goes to Pine Lakes Golf Course for providing a wonderful place to play and prepare for area and state tournaments. And without our Partners, it would be impossible to put together the Unified Program for Morrow County Special Olympics. Other appreciation goes to local churches and civic groups that are so kind to provide donations throughout the year. Sacred Hearts in Cardington and the Mount Gilead Presbyterian churches do fund raising breakfasts, as does Mount Gilead Masonic Lodge 206. Others have given personal gifts that help to keep Special Olympic functioning. 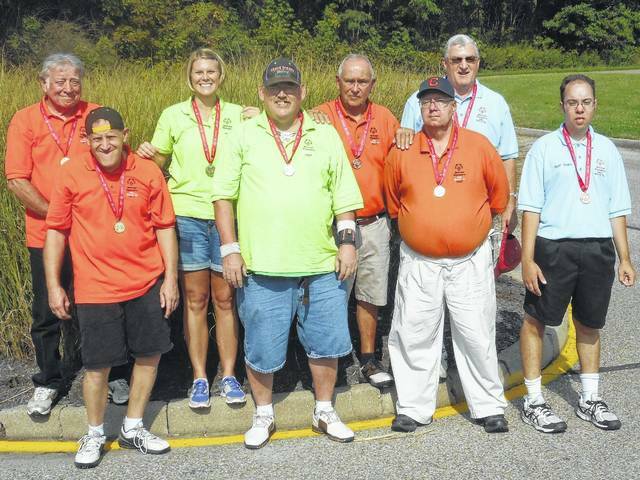 If you are interested in knowing more about Special Olympics Golf or wish to be considered for a partner, contact Don Barchus at Morrow County Board of Disabilities at 419-947-7045.
https://www.morrowcountysentinel.com/wp-content/uploads/sites/29/2017/10/web1_special-olympics-golf.jpgMorrow County Special Olympics team members are, front row, from left, Jason Pryor, Dennis Payton, Glenn LaVan, Cody Cover. Back row, Larry Pryor, Andi Updike, Vinal Terry, Jim Trainer.